Custom Gable boxes are made in different shapes and sizes. The most famous and used shape of these boxes is the shape of hut. Imagine you have a product that is made for pet animals like dogs. The best way to present this product to your buyers is the packaging that is in the shape of pet or dog house. Gable box packaging is a perfect fit for these kind of products. Gable boxes can be made and designed in a way that they exactly look like mini dog houses. Gable boxes usually have handles on the top for easily carrying these boxes. Below are few of the features of Custom gable boxes those make these boxes perfect presentation for any product that goes inside. These boxes can be made in the form of dog house or if you are in architecture businesses you can present your kits in these boxes as well because you can design and make these boxes in a way that they look like a little building with architecture details. These boxes can be fully customized with shape and design and you can play with these boxes with innovative ideas of designing your product and presenting into the market. These boxes can also have window cutouts on front and back to show real house windows to show your product from the inside as well. The top handle of the box can also be customized or can be removed as well. These boxes are very easy to use and handle. These have side locking tabs those can be unlocked easily and product can go inside easily as well. These boxes are quite cost effective as well compared to other packaging options available in the market. 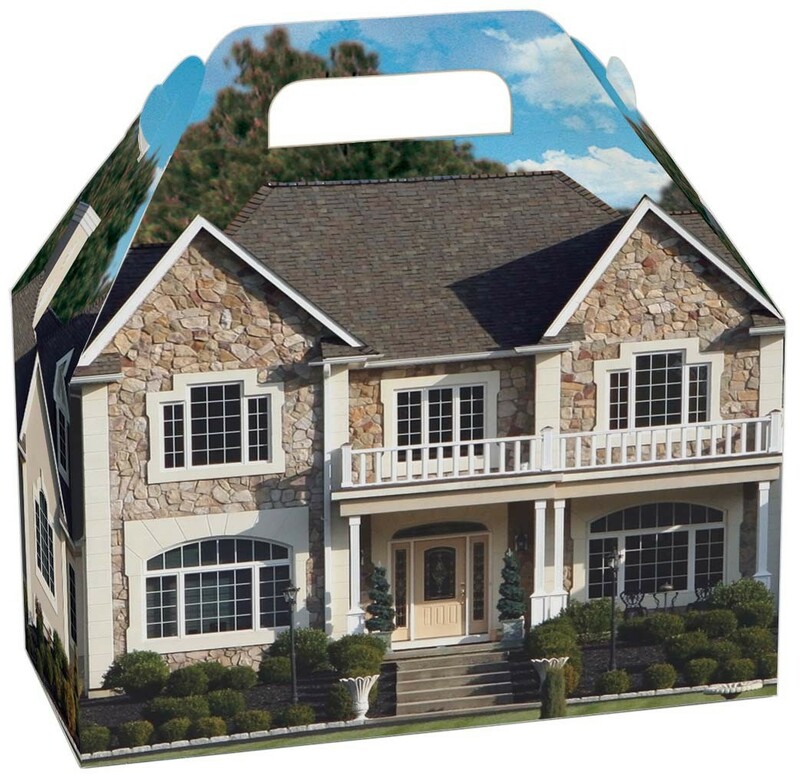 These custom gable boxes are made out of standard 18pt card stock but if you want to put heavy items inside which weight more than 4 lb then you should consider using corrugated stock for these boxes. These can be printed from outside and inside as well. These are printed on a flat sheet and then die cut and pasting. These ships as flat and are pre-glued. Upon receiving these boxes, you just need to pop-up the boxes and they are ready to use. These boxes load from the top and have the auto-lock bottom. There are side locking flaps those lock with the top handle for securing these boxes properly. 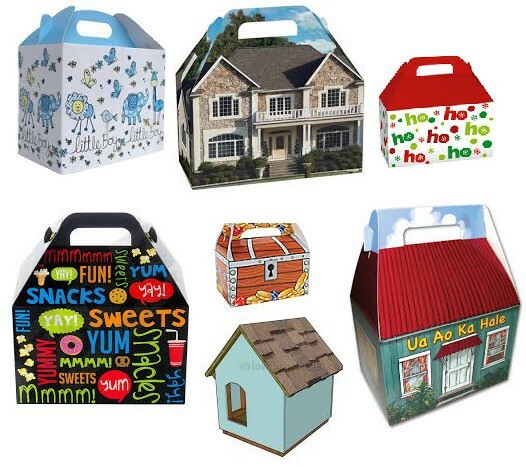 Gable boxes are by far the most presentable and unique boxes for any product ranging for pet products to food items to apparel items. These custom printed gable boxes are mostly used as gift boxes and are also used to place items on the shelf. These custom gable boxes are the most widely used boxes in the US and can be ordered as low as 100 or as high as 100,000. Price range of these boxes varies from $0.49 cents a box to $0.29 cents a box depending on the size and quantity of the order. If a window is used, its recommended to have cellophane covering on the window to secure the product inside properly!